I’ve been lucky enough to work with Jazz on many projects over the years from organising crafty fun at her much loved Viva Cake nights to designing the Shoreditch Sisters WI rose emblem jewellery and showing a room bursting with WI gals how to make ’em. 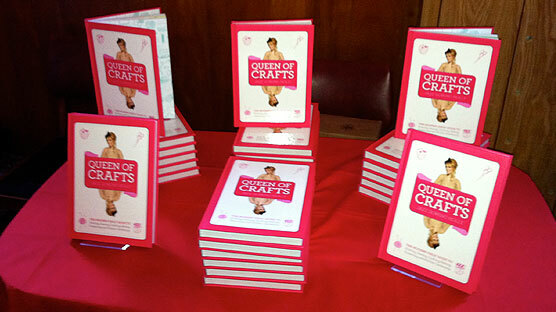 Jazz’s recent adventures have taken her into the world of publishing and she has written and launched a super book The Queen of Crafts filled with everything she loves from baking to quilting. 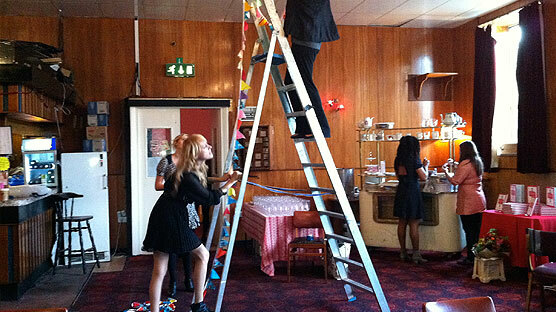 To launch the book in true Jazz style, the original gang of Viva Cake gals & Shoreditch Sisters descended upon the Bethnal Green Working Men’s Club for a rock’n’roll tea dance knees-up. With the help of my thrifty pals Mira, Kali and Jackie, I curated a One-Stop Vintage Haberdashery Shoppe and a crafty table transforming tea towels into tote bags. 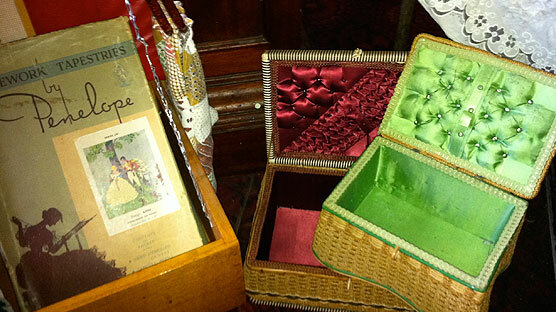 Our Shoppe was bursting with sewing baskets, buttons, fuzzy felt, cross stitch kits, wallpaper, patches, feathers, craft books, dress making patterns, sewing machines, wool – more crafty bits’n’bobs than you can shake a pom pom at. For the first part of the evening crafty fox Jackie ran a Thrift-ola sewing circle on the dance floor. 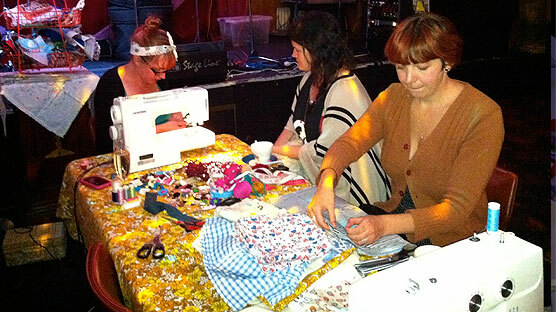 Here are some members of the all girl alternative choir Gaggle turning tea towels into tote bags. Our table of tea time treats. 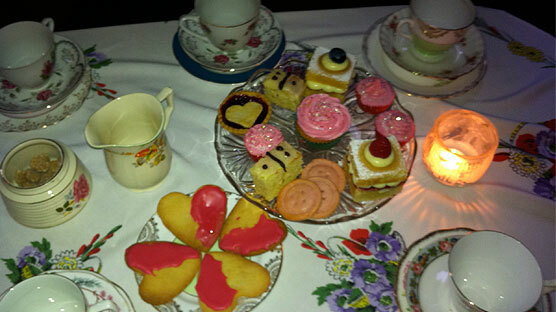 Each and every table in the club was adorned with a pretty embroidered table cloth and guests feasted on marmite sandwiches with the crusts cut off, homemade button shaped & heart biscuits, domino shaped cakes and a never ending supply of tea served up by the Viva Cake cuties. Such attention to detail as always. It was like nothing had ever changed since I went to the first ever Viva Cake rock’n’roll tea dance back in 2006. We’re all just a little bit older. 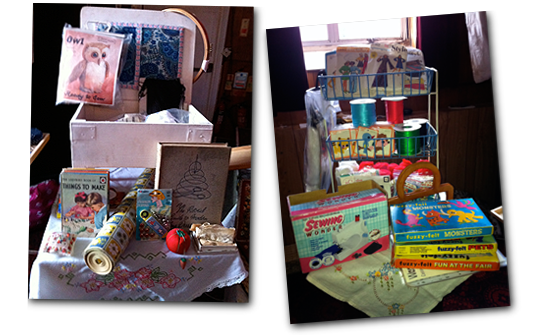 If you didn’t make it along on the night check out all my vintage haberdashery items in the Craft Club collection!